Exuberant! - "It's My Party ..."
"It's My Party ... " began with an experimental watercolour that I love, using Color Burst. I had a piece of purple silk from a kit that I didn't make and a piece of gorgeous silk in sunset-y colours (The Thread Studio - aka "Other Dale") that I was "saving" for something. After I applied MistyFuse to the sunset-y silk, I cut it into curvy shapes with a rotary cutter and fused it on to the purple background, using some of the pieces to hold the watercolour in place. I then put stabilizer under the purple silk and stitched the curvy pieces with copper metallic thread, followed by copper-coloured foil, tiny pink beads, pink metallic fusible Kreinik braid (I am so glad to get rid of some of that! ), and hot-fix crystals. 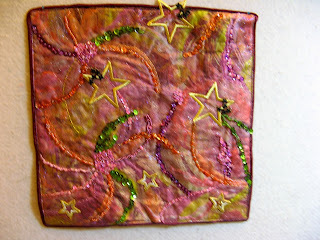 I started with a piece of white fabric and appliqued swirls of purple batik, sun dyed pink and green, a small pop of teal. Painted any exposed white fabric with purple and light blue lumiere. Then I cut a big hole in the middle and inserted a web of dazzle threads in hello, black and red. Exhuberant describes the feeling when I cut the hole out of the completed quilt top. “Exuberance” turned out to be a wonderful opportunity to sort beads and sequins while playing with them! 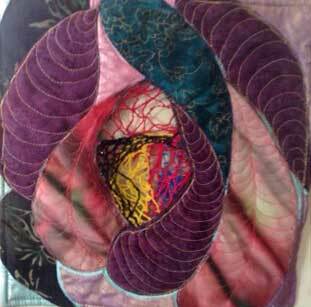 I started with a piece of fabric and Kool-Aid dyed silk roving and handkerchiefs. Did some layering of these, added some Angelina fibres (I would use these more sparingly next time, as they reflected light and made the end product hard to photograph). Then used Misty Fuse and fine black tulle to sandwich things together. Next for the embellishments! Some thick rayon threads for running stitches, and then lots of sequins and beads, and some iron-on stars. Final piece makes me think of both Mardi Gras and fireworks. When I hear a great song on the radio I just have to dance! I dance while cooking dinner, cleaning the house, ironing, you name it. I " chair" dance in the car to a great tune! When I first saw the challenge was " Exuberance" I had to admit that I was stumped at first. But nephew commented on how much I loved to dance so I decided this was a great place to start. I had hubby snap a few pictures of me dancing around my sewing room, then I chose a photo I liked and got to work. 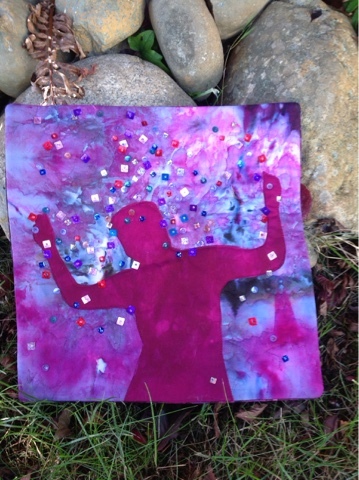 First I printed the photo, traced my silhouette then dug thru my hand dyed fabrics I choose the background from my iced dyed fabrics and the figure is from fabrics I dyed for a class I took a few years ago. 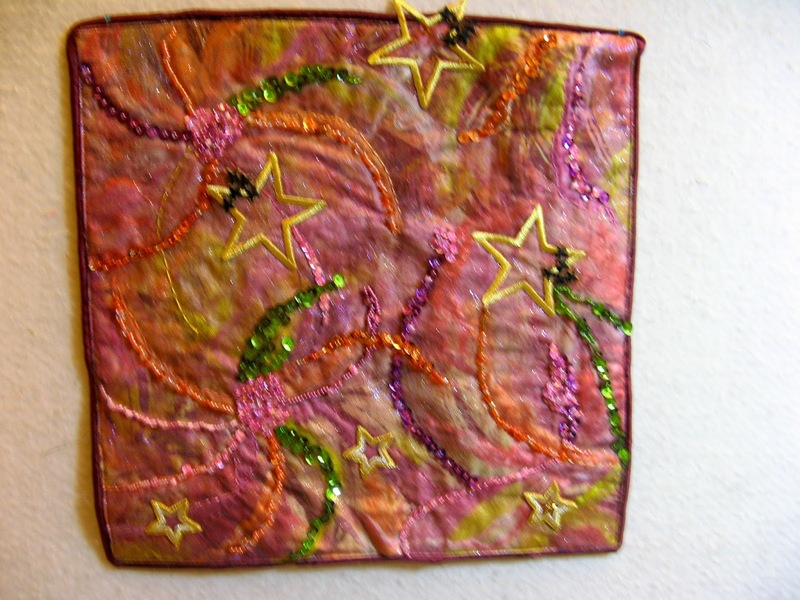 Once I had the piece fused and quilted it still looked a bit plain then I remembered some beads I was given earlier this month, they where the perfect colours so I got busy hand sewing all the beads and sequins on. This piece makes me smile and I hope you feel like dancing with me.